Boomers could easily pass for a well-equipped, basement playroom. You can find all the things here that you’d expect to see in someone’s home – jigsaw puzzle foam flooring, recliners, sofas and an assortment of toys you can find at any Toys R Us. The staff are warm and made me feel like I was being greeted by a friend. I received no introductory speech about indoor play space rules or rates. I was welcomed as if I was visiting a home. 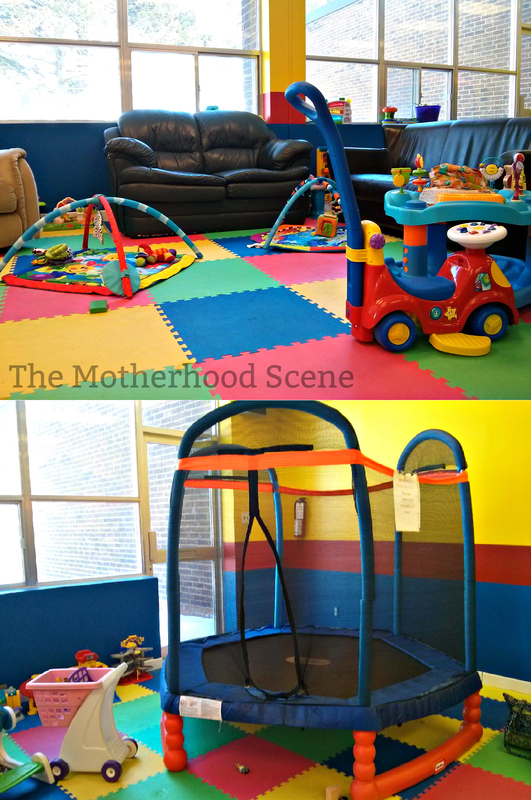 This location is perfect for a mom looking to entertain multiple preschool age kids because of the wide variety of toys on offer from costume dress-ups, a play structure for more mobile kids, two slides, a small see-saw, a rocking horse, Exersaucers and playmats for baby. Unfortunately, these toys don’t seem to have a ‘place’ and are left to lay haphazardly on the floor. This makes it tough to navigate with an infant that’s learning to walk. There isn’t a sectioned off area for infants like you can expect at an Early Years Centre, so you will have to clear an area for your baby and hope that the kids that can run around give you some space. Now on to the best and worst thing about Boomers: They have one of the softest foam floors I’ve ever come across! It stretches throughout the whole play space. This is great for keeping infants safe from any tumbles, but it’s not so well maintained. My only disclaimer is this: I wouldn’t recommend this location for any moms who have germaphobic tendencies. I count myself among them, so no judgement here! Many of the toys and foam flooring looked like they needed a good scrub so this place wasn’t for me. Boomers Play Place (Unit 2 / 111 Industrial Drive, Whitby) is open every day from 9:30am to 3pm, with the exception of Mondays and Saturdays. Cost: The rates are among the cheapest for an indoor play space in Durham. Infants aged 0-9 months visit free and children aged 9-24 months are $5. Additional siblings are 20% off and adults are free.